The Quadrant stock shapes can easily be machined on ordinary metalworking and, in some instances, woodworking machines. However, there are a few points, which are worth noting to obtain the best results. In view of the poor thermal conductivity and the relatively low melting points of thermoplastics, the generated heat must be kept to a minimum and heat build-up in the plastics part avoided. This is in order to avoid colour changes or even melting. Tools must be kept sharp and smooth at all times. A good safe removal from the tool must be assured. Coolants should be applied for operations where plenty of heat is generated (e.g. drilling). Machining forces are lower for engineering plastics than for metals, therefore clamping pressures may be reduced. But as these materials are not as rigid as metals, it is essential to support work adequately during machining in order to prevent deflection, e.g. Thin walled bushings often require an internal plug for accurate machining of the outside diameter. Carbon steel, high-speed steel and hard metal tools can be used. However, tungsten carbide tipped tools or diamond bit tools are preferred for long production runs and are a must when machining glass or carbon fiber reinforced materials. When the use of coolants is required, cooling liquids of the soluble oil type do generally very well. They should, however, not be used when machining thermoplastics which are susceptible to environmental stress cracking such as PC, PEI and PSU. For these materials the most suitable coolants are pure water or compressed air. The machining tolerances required for thermoplastics parts are generally considerably larger than those normally applied to metal parts. This is because of the higher coefficient of thermal expansion, plus swelling due to moisture absorption and possible deformations caused by internal stress relieving during machining. The later phenomenon mainly occurs on parts where machining causes symmetric and/or heavy section changes. In these cases, a thermal treatment (stress-relieving) after premachining and prior to final machining of the part might prove necessary. Of the nominal size can be applied without taking special precautions (min. 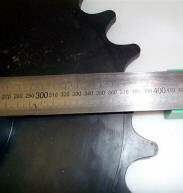 tolerance for small sizes being 0.05mm).